PARIS (AFP) - France prepared to fall silent at noon Monday (Nov 16) to mourn victims of the Paris attacks after its warplanes pounded the Syrian stronghold of Islamic State in Iraq and Syria (ISIS), the militant group that has claimed responsibility for the slaughter. With a manhunt under way for suspects across Europe, French police released a photograph of a “dangerous” suspect also wanted in Belgium, where Friday’s bloodbath may have been planned. France was to observe a minute’s silence at midday, which the European Union has called on all member states to respect. In the United States, the Stars and Stripes will fly at half-mast at the White House until sunset Thursday. President Francois Hollande will observe the silence at the Sorbonne University, in recognition of the large toll of young people among the 129 dead. Another 352 were injured, scores of them seriously. The worst terror attack in French history has stunned the capital, less than 11 months after jihadists struck satirical magazine Charlie Hebdo and a Jewish supermarket, killing 17. Despite a state of emergency, schools were to reopen Monday morning with museums, theatres and other cultural centres following at 1:00 pm after being shut in the wake of the attacks. French warplanes pounded ISIS's Syrian stronghold Sunday in the nation’s first retaliation against the jihadists. 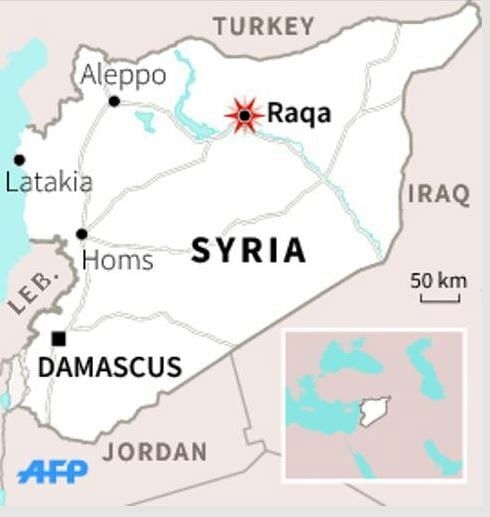 The raid destroyed an ISIS command post, a recruitment centre, a munitions depot and a “terrorist” training camp in Raqa, the defence ministry said. The operation was coordinated with US forces by a dozen aircraft which took off from Jordan and the United Arab Emirates, it said. Hollande has denounced the Paris attacks as an “act of war” and vowed to hit back against ISIS “without mercy”. French police said they were seeking 26-year-old Salah Abdeslam, who is said to be one of three brothers linked to the slaughter. He is believed to be either on the run or one of the gunmen who died during the attacks, security sources said. He lived in Brussels, in the rundown immigrant neighbourhood of Molenbeek, where police have made several arrests. The attacks “were prepared abroad and involved a team situated in Belgian territory and who may have benefited from... complicity in France,” French Interior Minister Bernard Cazeneuve said after talks Sunday with his Belgian counterpart, Jan Jambon. “We are determined to act together... to dismantle the (jihadists’) networks”, he said. As the investigation spread across Europe, police carried out raids in Bobigny, in the northern suburbs of Paris, on Sunday evening. Prosecutors said they believed three groups of attackers were involved in the carnage, and they have not ruled out that one or more assailants may still be at large. The heavily-armed gunmen wearing explosives vests opened fire on crowds enjoying a Friday night at outdoor cafes and at the Bataclan concert hall, scene of the worst carnage where 89 people were killed as they watched a gig by the American group Eagles of Death Metal. Seven of the gunmen and suicide bombers died in the bloodshed, with three blowing themselves up outside the Stade de France as France and Germany were playing an international football friendly. Prime Minister Manuel Valls said authorities have so far identified 103 of the dead, who included journalists, lawyers, students, parents of small children. Most are under 40. More than 25 foreigners from over a dozen countries were among the victims, with the first US fatality confirmed as California State University student Nohemi Gonzalez, 23, who died at the Petit Cambodge restaurant. It is now known that three of the suicide bombers were French nationals, two of whom lived in the Belgian capital Brussels. In a further sign of the growing Belgian connection, investigators said two cars used in the violence were hired there. One was found near the Bataclan venue, and the other in the suburb of Montreuil east of Paris, with a number of AK47 rifles inside. Witnesses said the second car, a black Seat, was used by the gunmen who shot dozens of people in bars and restaurants in the hip Canal St Martin area of Paris. The first attacker to be named by investigators was Omar Ismail Mostefai, a 29-year-old French citizen, who was identified by a severed finger found among the carnage at the Bataclan. Meanwhile, the discovery of a Syrian passport near the body of one suicide attacker has raised fears that some of the assailants might have entered Europe as part of the huge influx of people fleeing Syria’s civil war. Greek and Serbian authorities have confirmed the passport was issued to a man who registered as a refugee in October on the island of Leros and applied for asylum in Serbia a few days later. But European Commission President Jean-Claude Juncker, who has urged EU countries to take in more refugees, said there was no need for a complete review of the bloc’s policies. “Those who organised, who perpetrated the attacks are the very same people who the refugees are fleeing and not the opposite,” he said. ISIS said it carried out the attacks in revenge for French air strikes in Syria and threatened further violence in France “as long as it continues its Crusader campaign”. World leaders on Sunday denounced terrorism at a heavily guarded G20 summit in Turkey and observed a minute’s silence for those killed. In an outpouring of solidarity, more emotional vigils were held across the globe over the weekend, and in many capitals, buildings and monuments were illuminated in the red, white and blue of the French tricolore. In Rome the lights of the Trevi Fountain and the Colosseum were turned off Sunday night in a silent tribute. And in a striking gesture, the great pyramid in Egypt was bathed in French, Lebanese and Russian colours in homage to the victims in Paris as well as those in the Beirut bombings, and the Sinai plane crash.